We’re looping through the books list in the ‘content’ div. This is how you write a template for a GAE app. ‘index.html’ was plain html/css, so there weren’t any template specific tags. But the ‘results.html’ file has a lot of template specific code. We’re looping through the ‘books’ list object, which has a dictionary object per book. Then we access the properties for every book using the ‘dot’ syntax. Take a look at the line where we’re accessing the book’s author. It’s written as ‘book.author | check’. 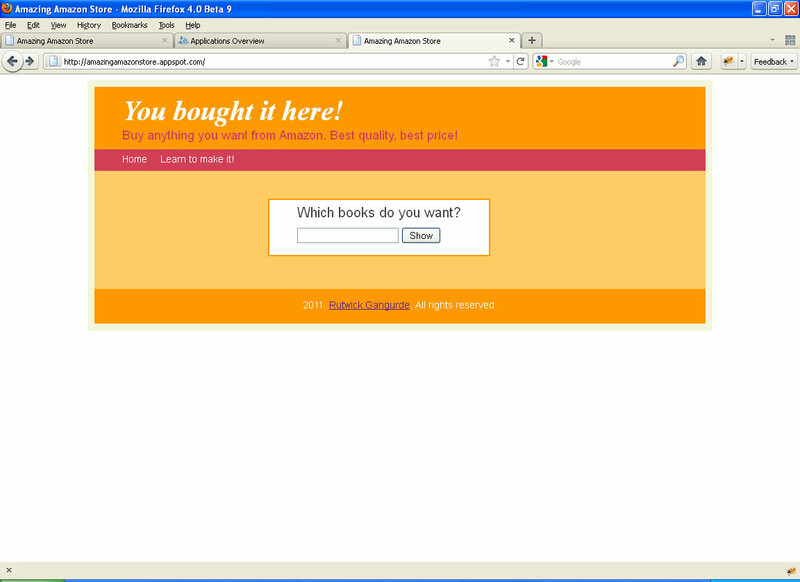 A single book can have multiple authors, which will be returned in the form of a list object. We have to join these names as a single string. So if a book has 2 authors say a and b, which will be returned as a list object by the ‘xml2obj’ module, [‘a’, ‘b’], then the resultant string should be ‘a, b’. We can’t do the checking here within the template. This is where the custom template tag ‘check’ comes in picture. We pass the ‘book.author’ to the ‘check’ function (this is how you pass an argument to a custom template function) which checks if it’s a list object with multiple authors, and joins them in a single string. Let’s see how to register our custom template tag ‘check’. Save this as ‘check.py’ in the ‘customtags’ folder. The check function takes one argument, checks if the argument is a ‘list’ object, and if it is, the joins them as a single string with commas inserted in between the values. If not a ‘list’ object, then returns the ‘key’ as it is. The ‘register.filter’ function means, whenever the term ‘check’ is used in the template, call the ‘check’ function. This registers the ‘check.py’ file from the ‘customtags’ folder ( ‘check’ without the ‘.py’ extension). If you named the folder as ‘abc’ and the custom template tag file as ‘xyz.py’, then you’d register it here as ‘template.register_template_library(‘abc.xyz’). That’s it! Our template tag ‘check’ can now be used in the templates. Run the app using the command ‘dev_appserver.py ‘ and visit the url, http://localhost:8080/. What’s left is uploading the app on the actual GAE server. Head on to http://appengine.google.com, use your google account to login and register an ID for our app. Copy this ID and replace ‘blogapp’ with this ID in the ‘app.yaml’ config file. Now use the ‘appcfg.py update ‘ command to upload the app to the GAE server. It will take some time to upload. Once done, visit the url http://www..appspot.com, to see the app in action. 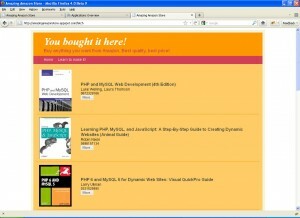 Congrats guys… You have your Amazon book store set up on Google App Engine. Everytime someone purchases a book via your website, you get paid for it! Please help me make this post better. I don’t have the best writing style you ever came across, but that doesn’t stop me from spreading the knowledge! Any suggestions, comments, criticism are welcome! Contact me at mail@rutwick.com, Twitter: @tweetrut. Thanks a lot Sidhant… your feedback is valuable! I’m experimenting with a couple of other frameworks with GAE… readers can expect more on it! Rutwick, thank you for writing this up, great tutorial and really helpful. Very sorry for replying late, been a little busy! Thanks a lot, I’m glad it helped you! I will definitely write more on GAE, I’m a big GAE fan!